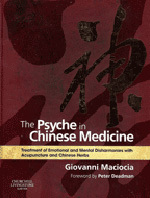 The Psyche in Chinese Medicine comprehensively discusses the treatment of mental-emotional disorders with both acupuncture and herbal medicine. Suitable for practitioners and students of Chinese medicine it discusses first the aetiology, pathology and diagnosis of mental disorders. It explores the nature of the Mind (Shen), Ethereal Soul (Hun), Corporeal Soul (Po), Intellect (Yi) and Will-Power (Zhi) and then presents the diagnosis and treatment of the most common psychological disorders with both acupuncture and Chinese herbs in detail. Specific chapters focus on the treatment of common conditions including depression, anxiety, insomnia, panic attacks, bipolar disorder and Attention Deficit Hyperactivity Disorder. Each condition is illustrated with case histories from the author’s 35 years-long practice.